Join the acropolis crew in downtown Disney to make some noise for the band you think belongs on the VANS WARPED TOUR 2011 and stick around for special guest headliners, A STATIC LULLABY! 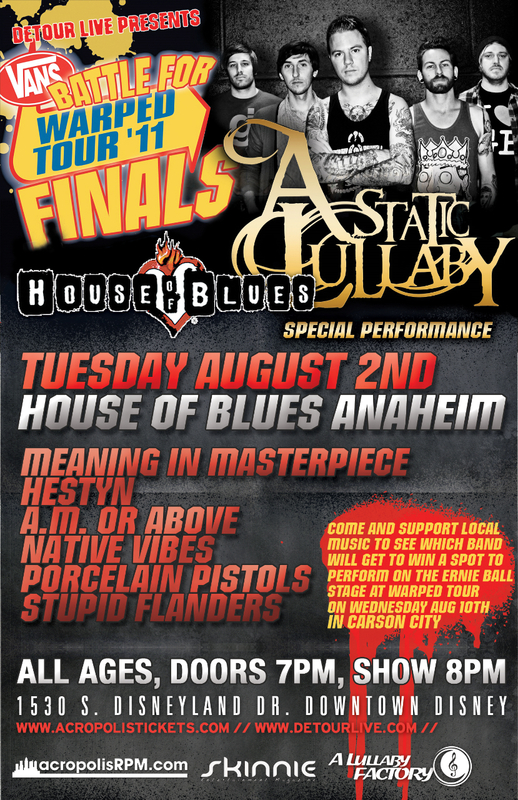 Notes: BATTLE FOR WARPED TOUR CARSON FINALS featuring special guest headliners A STATIC LULLABY and Meaning in Masterpiece, Hestyn, A.M. or Above, Native Vibes, Porcelain Pistols and Stupid Flanders. This entry was posted in NEWS and tagged A static lullaby, A.M. or Above, acropolis records, acropolisRecords Showcase, acropolisRPM, asl, Battle for Warped Tour, Hestyn, Meaning in Masterpiece, Native Vibes, Porcelain Pistols, Stupid Flanders, Warped Tour. Bookmark the permalink.